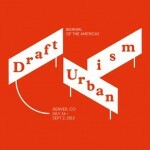 “Draft Urbanism” is the exhibition theme of Denver’s 2013 Biennial of the Americas celebration. 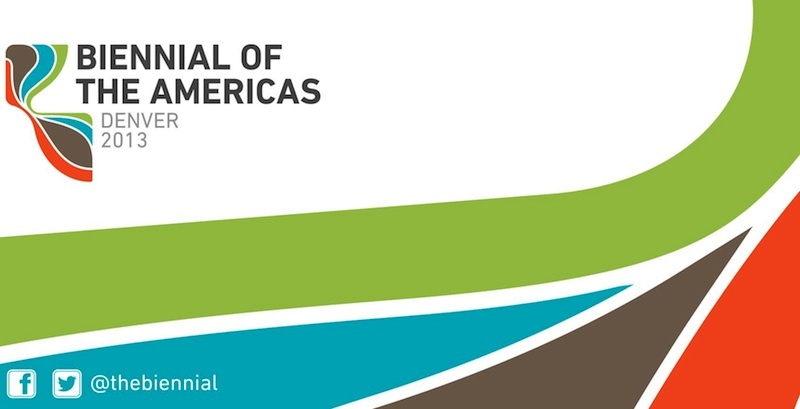 The Biennial is an “international festival of ideas, art, and culture” that provides an opportunity for leaders in business, government, philanthropy, and the arts to examine significant issues affecting life in the Americas. Depending on your point of view the Biennial is either a compelling demonstration of Denver’s cosmopolitanism or a massive marketing ploy to boost this dusty old cow town’s clout in the Western hemisphere. Whatever the case, this summer’s exhibition of architecture and art throws a welcome light on the status and potential of Denver’s public spaces. Draft Urbanism is based on the premise that urbanism is always in flux; i.e., that the city is always in a state of becoming. 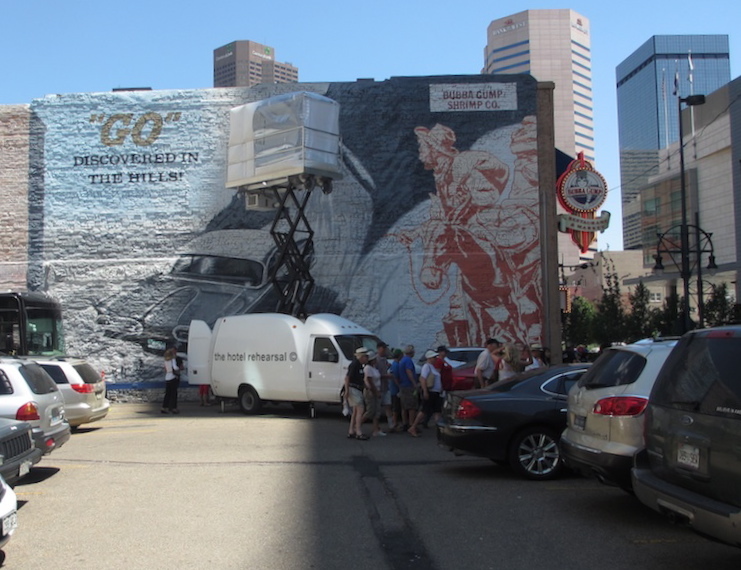 Four major architectural installations in downtown Denver anchor the exhibition. These installations address site-specific needs and planning challenges, and prompt thought about the public city of the future. The rest of the exhibition includes artwork that’s distributed in 67 other sites (billboards, bus shelters, etc.) in a dozen neighborhoods covering over 10 square miles of Denver. These pieces speak to more general themes in global urbanism. Together, Draft Urbanism makes the city one big outdoor exhibition. It transforms Denver into a city “to be contemplated rather than passively experienced.” I describe the architecture here and the art in a follow-up post. 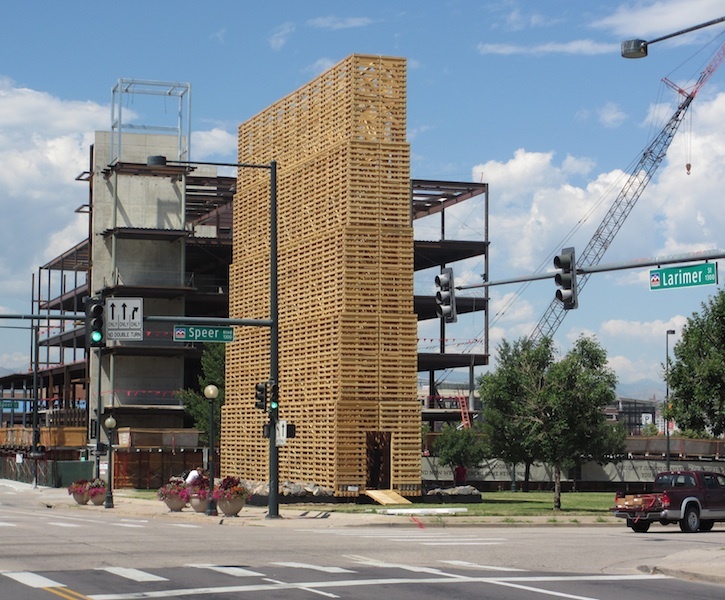 Mine Pavilion (by Pezo von Ellrichshausen) is a five story tower located in the median of Speer Boulevard near the point where Denver was founded as a mining settlement back in 1858. It addresses the challenge of connecting the Auraria campus—shared home of the Community College of Denver, Metropolitan State University of Denver, and the University of Colorado at Denver (UCD)—to the rest of downtown. It does so not by moving people across Speer Boulevard, but by in-filling a grassy median that currently functions as a bit of a No-Man’s Land. The structure’s wooden latticework is constructed of beetle-kill pine and riffs on the scaffolding of a mine shaft. The structure can be viewed in ways that allow for multiple identities: as a tower, a tunnel, a bridge, and a billboard. One of Draft Urbanism’s curators, Paul Andersen of Indie Architecture, said in a public lecture that he didn’t see the crossing of Speer Boulevard as an “interesting” architectural problem. However, my spouse confirms that there were several pedestrian deaths in the area while she was an architecture student at UCD in the early 1990s. Thus, filling the dead space of the grassy median is a start, but urban planners and architects might go a bit farther—with an actual bridge or below-grade foot/bike path—if they want to activate unused space and eliminate a persistent pedestrian danger. Skyline Cloud (by Plan:b Arquitectos) addresses another underutilized space problem, one that exists at the western end of downtown’s Skyline Park. 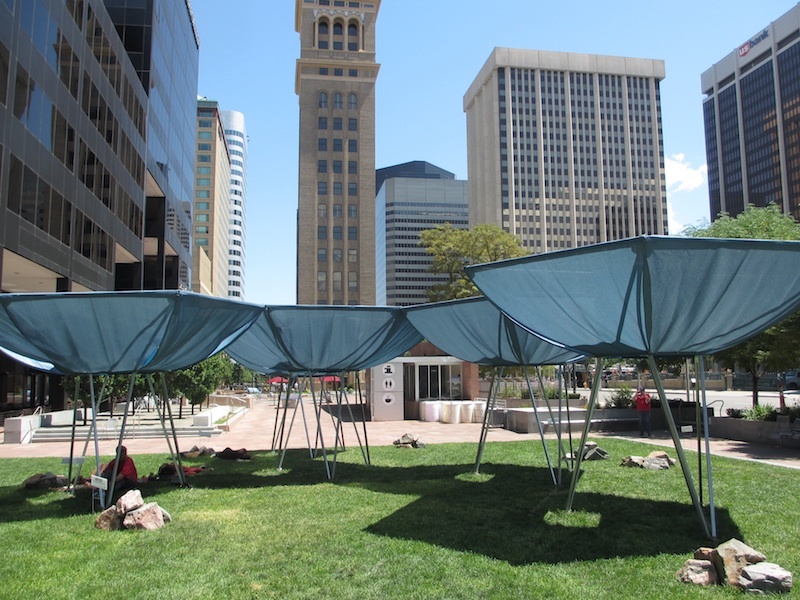 Skyline Cloud is an array of 11 foot high steel and nylon fabric modules designed to provide shade for a little-used section of lawn. The modules are inverted hexagonal umbrellas that resemble clouds. They can be used separately or in series. The intention is to “encourage spontaneous activity” and help build “social infrastructure.” At time of my visit there wasn’t much social activity occurring under the clouds other than some young folks laying about. Hybridizes two traditionally distinct mechanisms of urban mobility: the automobile, icon of suburban sprawl, and the elevator, icon of urban density. Ethnically, socially, economically, and culturally the once clear distinction between city and suburb is becoming rapidly blurred. The Hotel Rehearsal is a hotel prototype for this increasingly mixed context…The Hotel Rehearsal presents a fresh perspective on how to use the surface parking lot…it anticipates a potential future of the lots…Each parking space can be individually and temporarily developed, and vehicle-buildings can move within and between lots. Amenities can be accessed in adjacent streets or by driving to other locations. The hotel room becomes a dynamic building block for a progressively small scale and provisional city. I love the symbolism and whimsy of The Hotel Rehearsal. Certainly, not all architecture should problem-solve lest we inhibit creativity. But this installation may come up short if the challenge is to enliven public space. Individual privacy and anonymity are lost with the room raised, but the occupant is still on display. This gives force to Richard Sennett’s complaint (in Flesh and Stone: The Body and The City in Western Civilization) that public spaces, at least in Western culture, far too often serve as “places of gaze” rather than “scenes of discourse.” And I’m not sure that the activation of surface parking lots by driving “vehicle-buildings” in-and-out, and between parking lots and the city’s amenities, moves the ball forward on environmental sustainability. But all of this is debatable. By the way, the Curtis Hotel is currently offering a package deal that includes a one night stay in The Hotel Rehearsal for $50,000—a price that includes some diamond jewelry, a couple of ipods, and a dance party for 100 people in the Curtis Ballroom. 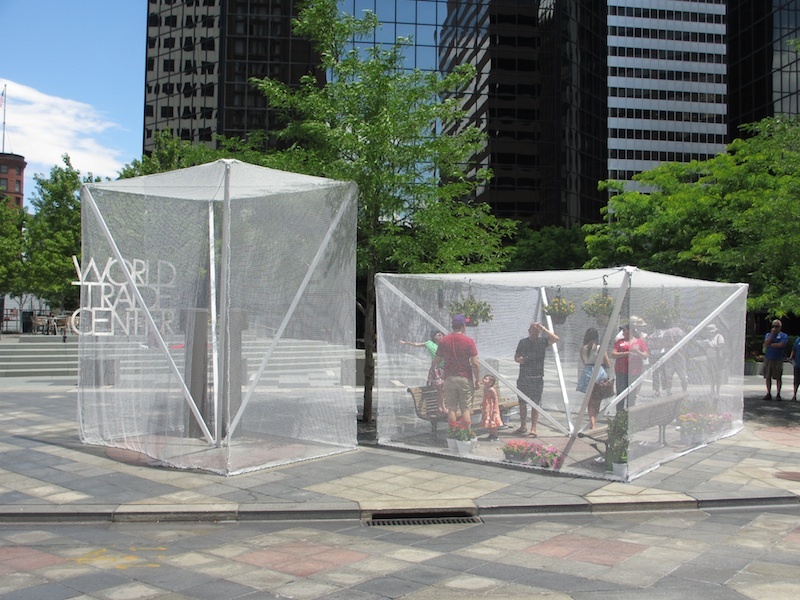 The Mirror Stages (by June14 Meyer-Grohbrügge&Chermayeff) are four butterfly enclosures on Denver’s 16th Street Mall. They enclose different pieces of site furniture like benches and phone booths. The installation seeks to introduce biodiversity and provide “a strategic escape from the cacophony of the mall.” In a site tour Draft Urbanism Executive Curator Carson Chan noted that the phone booths have seen increasing use since they were enclosed by the butterfly netting. Chan also notes, in a New York Times Style Magazine interview, that “by introducing a new species to the existing urban ecology [The Mirror Stages] aims to call out the unarticulated tensions between downtown’s various subcultures.” I’m not sure I see the connection here. This might be a case of the architect getting a bit too ambitious about what they hope to achieve with built form. But I love the interdisciplinary sensibility. One purpose of the Biennial, as disclosed by Carson Chan in the New York Times interview, is to ask whether there’s such a thing as a “pan-American cultural thread” running from Canada to Chile and connecting everything in between. The architectural installations, and the Draft Urbanism exhibition as a whole, go some way toward strengthening the connections. But the overall question is still open if Mark Rinaldi’s summary review of the Biennial in the Denver Post is any indication. According to Rinaldi there was nothing very Canadian about the Biennial’s “Canada Night.” The “Mexico Night” erred on the side of celebrating traditional Mexican culture at the expense of that country’s contemporary culture. According to Rinaldi “Denver Night”—perhaps predictably—fared the best. Thus, the Biennial of the Americas still has growing pains. But Draft Urbanism is a very nice exhibition. The four architectural installations described here succeed in prompting new thinking about the possibilities for the future design of public space, and in raising new questions. And Denver remains, by virtue of its location and popular appeal, an excellent place to explore interculturalism in the city and to test the integrating power of architecture and other forms of material culture. Including billboard art, which I’ll cover in the next post. 1. Mine Pavilion is like a chapel. The play of light and shadow in the space is wonderful. It may be the most successful component of the Biennial. Whether or not it does a good job of bridging the gap is debatable, but it is a beautiful object never the less. 2. It’s unfortunate that an architect as well educated and as well versed as Mr. Anderson fails to see the interest in bridging the gap between downtown and Auraria. It’s a horrid space that no one appears to want to occupy and yet many need to as they traverse between two distinct parts of the city. From my poor perspective it’s one great failure of the city’s planning efforts; a vehicular scar that segregates two active districts. The area has been the subject of many design exercises and none appear to have solved the problem. How can that not be interesting to the creative community? Surely there’s a book in there somewhere. And another thing, never mind the arrogance of the Curtis Hotel’s $50,000 one night stay offer, the concept of inflatable housing units should be further explored. It could be applicable to housing needs for disaster relief or, in a nod to architect George Hoover, professor emeritus at UCD, similar units could be hung from existing structures or fill vacant lots as temporary housing for the homeless or transitional housing for those leaving the streets.